The second Tenna Valley Freedom Trail, based on Servigliano in the Marche and organised by the WW11 Escape Lines Memorial Society, took place from May 7-12, 2014. John Simkins, of Monte San Martino Trust, reports on a trip that surprised and moved its participants in equal measure, and which took place in warm weather among beautiful countryside. Wednesday 7th May: We gather, in the evening, at the Casa della Memoria in Servigliano, the former railway station converted into a museum to commemorate the town’s PG59 camp, at various times in its history a prisoner of war camp and a refugee centre. It is just seven months since a similar gathering took place, on the occasion of the first Tenna Valley Freedom Trail, organised jointly by the WW11 Escape Lines Memorial Society (ELMS) and the Monte San Martino Trust. For 2014, and for the future, the event has been moved from September to May. This time there are about 30 of us, from the two organisations, who have come out from the UK. We will be joined on the walks, each starting and finishing in Servigliano, by local Italians and by expatriates living in the area. We are given a talk about the camp by Giuseppe Millozzi, an expert on PoW history in the Marche and the son of Antonio Millozzi, the MSMT’s representative in Italy who is based at nearby Monte San Martino. Giuseppe then guides us around the camp before we go the Hotel San Marco for an impromptu – but plentiful – dinner. 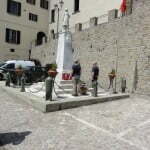 Thursday 8th May: After breakfast we make our way to Servigliano’s main square to lay wreaths at the town’s fine war memorial. Then, we set off for Monte San Martino, led by Giuseppe and by Ian McCarthy, who lives at Servigliano and has been indefatigable in organising the routes and other arrangements, along with Roger Stanton, director of ELMS. Unfortunately, we cannot cross the Tenna river, as we had the previous year, because severe flooding makes it impassable. The consequence is that more of the route than we would like is done by road. On the way to Monte San Martino, Paolo Giunta La Spada, a teacher and chairman of the Casa della Memoria, speaks about Mussolini’s years in power, and about the Fascist policy of creating jobs by moving people into rural areas to clear malarial swamps and make the land fit for agriculture. He points out Fascist slogans on recently restored farmhouses. These include “I popoli che abbandano la terra sono condannati alla decadenza (Those who abandon the soil become decadent”), and “La terra non tradisce ma nobilita (The land does not betray, it enobles”. With occasional lifts by car to make up time, we enter Monte San Martino for an excellent lunch prepared by the Comune, after laying wreaths at the war memorial. Setting off again, a small detachment makes a diversion to lay a poppy wreath at a memorial to Riccardo Funari, a young partisan shot dead by Fascists on a visit to his mother’s home. Funari’s death precipitated a revenge raid on Monte San Martino by partisans, during which four of the townspeople were shot dead, more or less at random, including one young man who just happened to be wearing a black shirt, the Fascist colour. Later in the afternoon, we stop at a house in Contrada Santo Stefano where an American soldier had been hidden in 1943-44. His name was Felippo Vacca, an American who emigrated to the USA at the age of 14. He was sheltered by the family of Sergio Virgili, and Vacca left a note, for the family’s postwar benefit, telling how well he had been treated. The walk ends at Servigliano cemetery, where we see the tomb of Frank Hilton, an English paracudista, who liked the area so much that he returned in later life, became known as Franco Baglioni and set up a charitable trust. Friday 9th May. Today’s walk is north to Massa Fermana and back to Servigliano. It’s a hot day and we are glad of the occasional drinks pause, with Steve Sims and Charles Perry providing top-ups and words of encouragement from their back-up vehicle that faithfully tracks the walkers. During the breaks Ian McCarthy reads extracts from Once a Hussar, a book by Ray Ellis, who escaped from Sforzacosta camp. Ray and a companion were bold enough to walk out of the camp, in full view of the guards, in August 1943, even before the Armistice. As they left, Ray shouted out a warning to the guards that, if they fired, they would be hanged when the Allies arrived. Their departure precipitated a mass break-out but only a few escaped, and there were casualties.Stopping at a shrine at the suitably named Madonna delle Camminate (Madonna of Treks), we hear how Ray and his friend felt guilty because they took a few coins from the shrine. Returning 40 years later, Ray said the Madonna “pretends not to recognise me”. Ray was hidden for a year by the Minicucci family, of Massa Fermana, and before we reach the village for lunch we are treated to an appointment with Elena Vita, whom Ray was courting at the time. 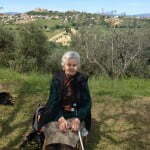 Elena, sitting upright and dignified among olive trees by the church of Madonna di Gagliano, is very recognisable as the pretty 17-year-old of 1943. Ray, who eventually got through the Lines to the Allies, would go to Elena’s house and sit with her, holding hands. “It was her eyes that attracted me most, they were so warm and kind.” There was always a chaperone, called Angelina, who occupied herself by plaiting straw, but at times she would tactfully withdraw to prepare food. Ray also believed Elena once saved his life, by running with her sister, in nightgowns, to warn him that Germans were on the hunt. During lunch, we are able to watch a video of the admirable Ray Ellis, telling his story. Ray, who became a teacher after the war and died earlier this year, was filmed by Anne Copley, her husband, son and Rob Dean. The walk back to Servigliano is mainly along the road, through Montappone and Monte Vidon Corrado, from where there is a fine panorama. In the evening, we meet Eleanor Bua, who has arrived from the UK with a specific mission. She wants to go to Monteurano PoW camp, near Fermo, to see if she can identify locations in the diary of William (Stuart) Campbell, the first husband of her mother, Maisie Brownfoot. Stuart, a talented artist who had met Maisie at art college in Leeds, made drawings for the camp’s magazine. Tragically, after being transferred to a camp at Bruz, Czechoslovakia, he was killed during an explosion at an arms factory. Elena is not the only person on the trip tracing connections. On Friday afternoon, Lawrence Thurgood, who lives in Newcastle, is driven out to a village near Servigliano, where – to his amazement and great pleasure – he meets up with members of a family who had sheltered his father after escaping from Sforzacosta. Similarly, Georgina and John Stewart, from Herefordshire, meet members of a family who gave refuge to Georgina’s father at Penna San Giovanni after his escape from Servigliano. Their stories will appear in full on the website at a later date. The walkers set off, again in warm weather, for Montelparo. This is the crowning moment of the Trail because we are to unveil a memorial to Signalman Sidney Smith, who was known to the locals as Giorgio and was shot dead by Germans and Fascists in March 1944. To read his story, please go to http://prod.msmtrust.org.uk/news/a-mystery-solved/. Before the ceremony, much to the relief of the walkers, who include 16 pupils from a school in San Benedetto and are fascinated by Sidney Smith’s story, Montelpare Comune give about 80 of us a splendid lunch, in a long, cool gallery. Afterwards, and before walking down to the lane where Sidney was killed, we adjourn to another room where we listen attentively to Raimondo Illuminati and Palmino Viozzi, who had known Sidney when they were aged seven and 12 respectively. Marino Screpanti, mayor of Montelparo, hosts the occasion with great warmth, and the presence of Lt Col. Peter Stoddart, from Sidney Smith’s Royal Corps of Signals, is fitting and very welcome. 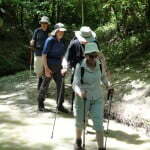 Following the ceremony, the walkers continue on, crossing the Aso and up to Montalto Marche and Porchia for dinner, before going back to Servigliano by bus. Sunday 11th May: The day is dedicated to memorial services and dedications to the contadini who assisted escapers. There are visits to Monteurano, Fermo and Porto San Giorgio and a meeting with the Brugnoni family at their safe-house farm. 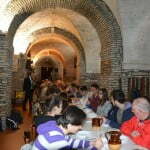 A final dinner takes place at San Marco hotel in Servigliano before the Trail ends and participants prepare to fly back on the following day, May 12th, tired but heartened by a marvellous experience.